Features -- Guangzhou -- 17 February 2017, updated 18 August 2017. 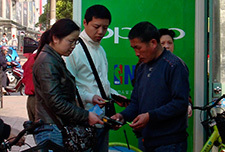 Article by Karl Fjellstrom, survey by Yunyi Li. 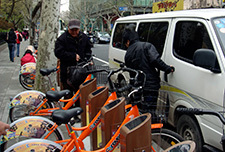 Mobike and other new generation bike sharing systems that do not require docks or stations and can be quickly and easily used via a smartphone application linked to now-ubiquitous mobile payments through Wechat and other platforms, has reversed years of gradual decline in cycling, made cycling cool and popular again, and rendered the old bike sharing model based on docks and stations obsolete. 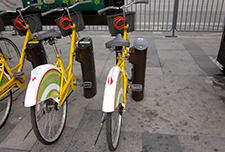 Since the first Mobike dockless, GPS-enabled bike sharing bikes appeared on the streets of Guangzhou in July 2016, Mobike and the other main dockless bike sharing systems - Ofo, Bluegogo and others - have rapidly supplanted the traditional bike sharing system based on docks and stations, and now account for more than half of all peak hour cycling trips along the BRT corridor. 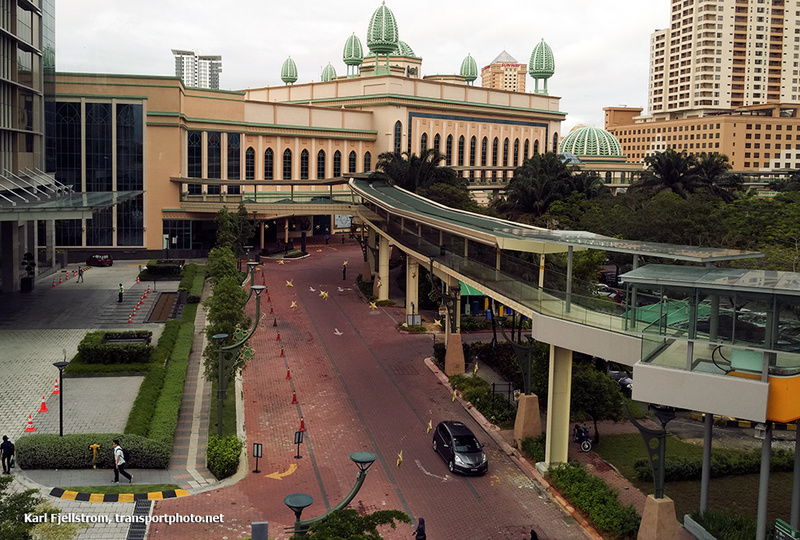 (During off-peak times, when travel is generally more discretionary and less geographically fixed, site observations suggest that the proportion of Mobike and new bike system usage is even higher.) 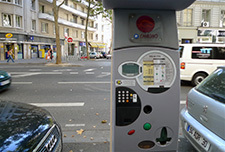 This has occurred despite the fact that the new systems do not provide a free usage tier, with the old system offering the first hour usage for free. Counts in August 2017 showed that the number of trips by bike at Huajing Xincheng had doubled since August 2014, from 1,500 to 3,000 trips per hour. 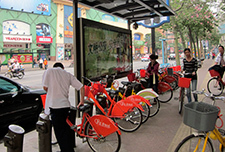 This article was originally written in February 2017, when the dockless bike sharing bikes comprised one-third of all the peak hour cycling trips at two locations along the BRT corridor in Guangzhou. 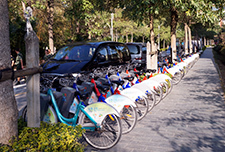 In a new count in August 2017 which more accurately compares the same time of year (August 2014 compared to August 2017), it was found that the proportion of new mode bike sharing bikes had increased to nearly two-thirds of all cycling trips at Huajing Xincheng, and 45% of all cycling trips at Tangxia. 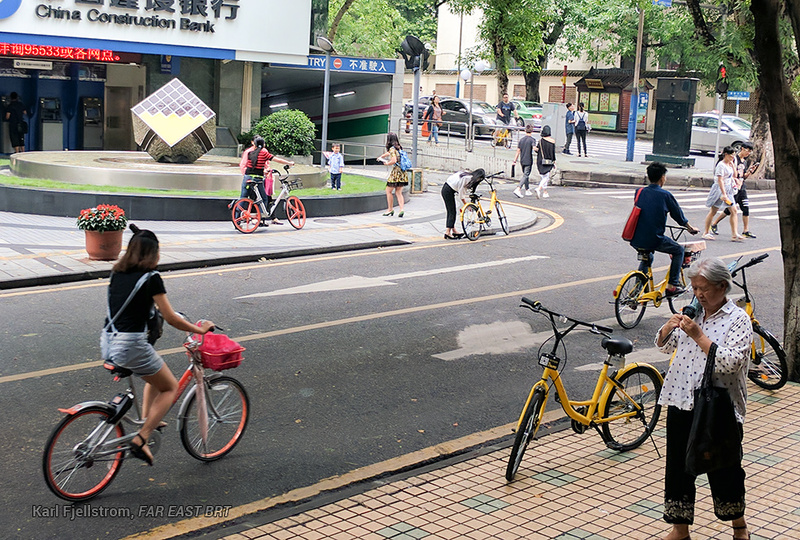 Mobike and Ofo users at the Huajing Xincheng survey location. Far East Mobility carried out counts of bikes passing three points along the BRT corridor in the morning from 8:18-9:18AM at two locations near the Huajing Xincheng BRT station, and in the evening from 5:05-6:35PM near the Tangxia BRT station. Both counts were on the north side of the road and covered bikes going in both directions along the BRT corridor. The counts were held at exactly the same time and location as counts done in August 2014, for comparative purposes. 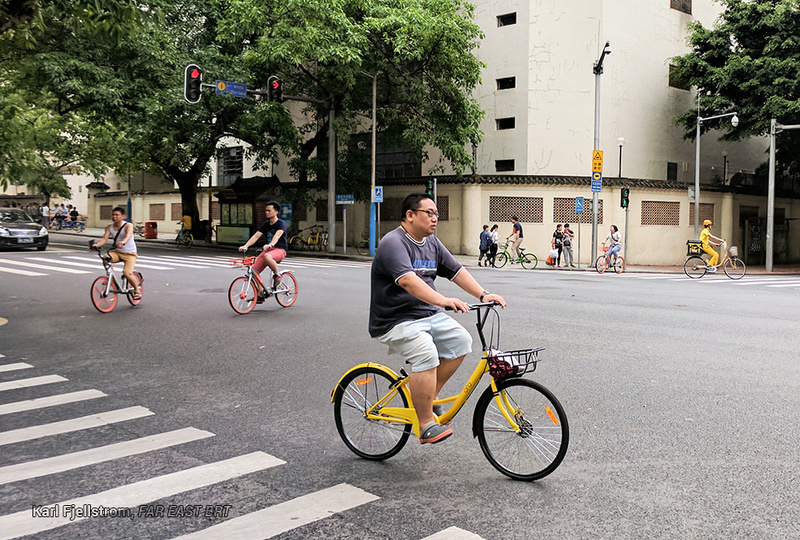 The results indicate a significant increase in cycling, and show that the new bike sharing systems, primarily Mobike and Ofo, now account for more than half of all peak hour bike trips. There has been a large overall increase in cycling numbers, by 100% in Huajing Xincheng and by 50% in Tangxia. 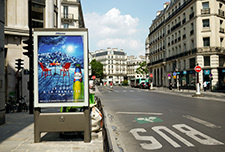 The traditional bike sharing system has been eradicated. The bikes and docks are still installed, but the system has practically no users. In the counts in February 2017 around 10% of bike sharing trips were still using the traditional dock-based bike sharing system. By August 2017 there was not a single user of the old system at Tangxia, and only 5 users at Huajing Xincheng, or 0.2% of all bike sharing bikes. Bikes per hour passing the north side of Huajing Xincheng BRT station. 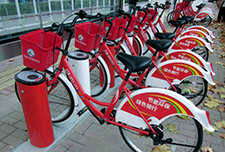 Bikes per hour passing the north side of Tangxia BRT station. The figures show that the total number of bicycle trips was similar to August 2014 levels in Tangxia in February 2017, but a 45% increase on the 2014 levels by August 2017, indicating that take-up of the new system is still rapidly growing during 2017. In Huajing Xincheng, the number of trips by bike in February 2017 was 40% higher than in 2014, and bike usage by August 2017 was double the 2014 levels. The counts in August 2017 showed that the number of trips per hour by bike had more than doubled from 1,511 in August 2014 to 3,211 trips in August 2017. The use of personal (non-bike sharing) bikes in the February 2017 survey was roughly the same as in August 2014, but the number of personal bikes had declined by around 10% by August 2017. 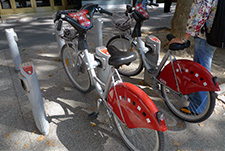 It is quite clear that the large increase in cycling is attributable only to the dockless bike sharing systems, and provided that the business model of the new system remains viable, usage of regular bikes is likely to further decline. Users have abandoned the old dock and station system and flocked to the new, dockless bike sharing bikes. 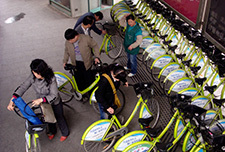 In areas where users have a choice between the old and new bike sharing systems, such as along the BRT corridor and in Jinshazhou, a high density new housing area in the west of Guangzhou where thousands of the traditional dock and station model bike sharing bikes were installed in early 2016 as part of an ill-timed signature initiative of former Mayor Chen Jianhua, the user preference is very clear: users have abandoned the old dock and station system and flocked to the new, dockless bike sharing bikes. 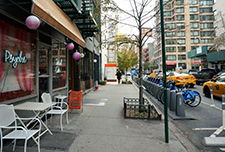 With a doubling of bike trips due entirely to the new dockless bike sharing systems, the onus is now firmly on local authorities and road designers to provide much better bike facilities in the form of continuous bike lanes, bike-friendly intersection design and operation, vastly improved greenway networks, and reduced conflicts between bikes and buses at bus stops. 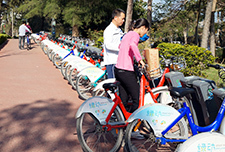 Shenzhen, which has practically designed and regulated bikes off the city's roads, is typical of the hostility or at best indifference still shown by many local authorities to cycling, which will hobble the potential for bike sharing to replace longer trips by motor vehicles. 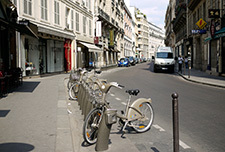 Bikes are still marginalized in the traffic system, with cyclists often forced onto walkways or discontinuous bike lanes. The rapid recent uptake of the new bike sharing systems will hopefully prompt improvements to bike lanes, and to bicycle treatment at intersections and bus stops. Location of counts carried out in August 2014, February 2017, and August 2017. Bike-bus conflict at bus stops along Zhongshan Road in Guangzhou in July 2017. 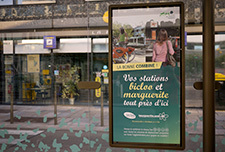 Design measures, including median-aligned BRT, are needed to solve this problem of bike-bus conflict at bus stops. Typical scenes throughout Guangzhou in 2017. Most cyclists are using the new dockless bike sharing models, but bike facilities have yet to be improved. 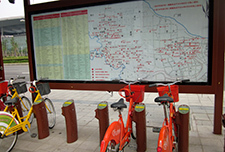 The days of the dock and station model of bike sharing, which also requires users to study maps of station coverage (see photo background), are now over.